Basically a cushioned guitar neck. Feels great, helps your playing. My patent covers any type of cushioning of any type of stringed instrument with a neck. Great for guitars. 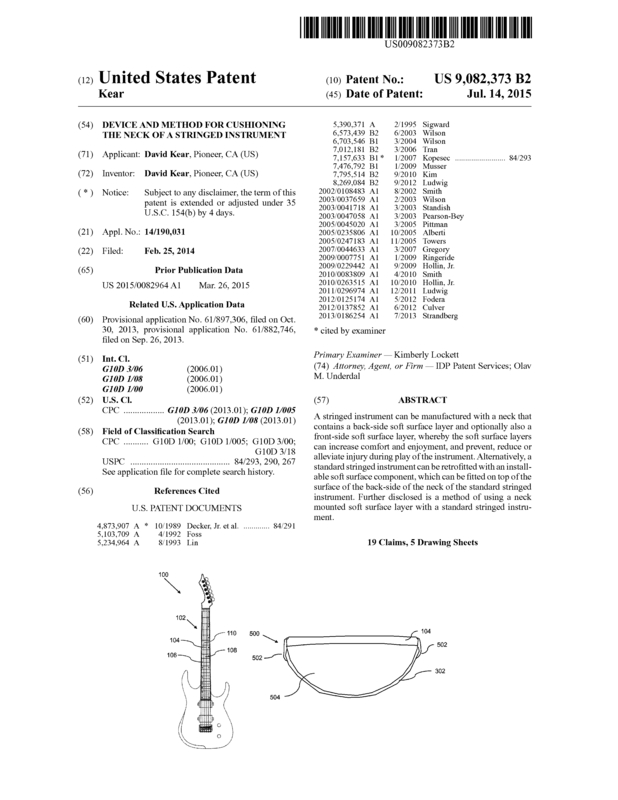 If anyone wants to cushion or make a guitar neck padded, they have to go through this patent. A stringed instrument can be manufactured with a neck that contains a back-side soft surface layer and optionally also a front-side soft surface layer, whereby the soft surface layers can increase comfort and enjoyment, and prevent, reduce or alleviate injury during play of the instrument. Alternatively, a standard stringed instrument can be retrofitted with an installable soft surface component, which can be fitted on top of the surface of the back-side of the neck of the standard stringed instrument. Further disclosed is a method of using a neck mounted soft surface layer with a standard stringed instrument. Page created at 2019-04-25 14:00:46, Patent Auction Time.